Ah, Ometepe! One of my favourite places in all of Nicaragua. A land of two prominent volcanoes in the middle of a lake which transmits beauty, tranquillity and fun. Let me take you through all you need to know about visiting Ometepe Nicaragua. 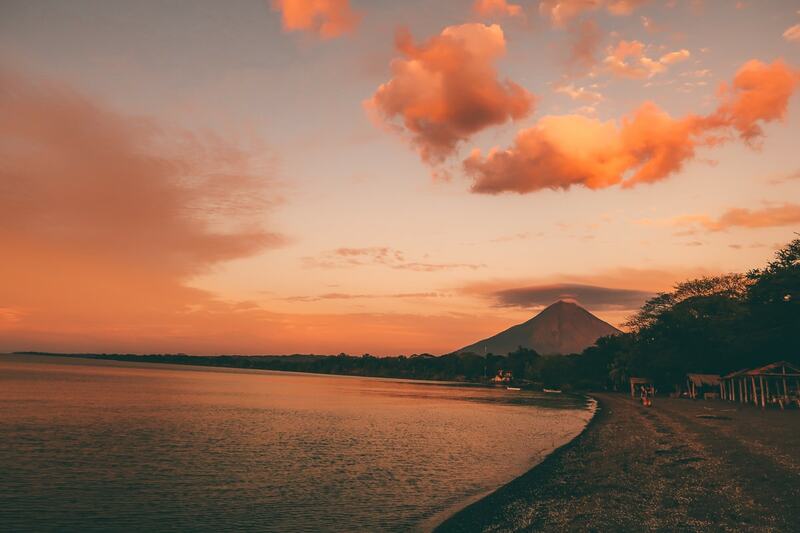 When is the best time to visit Ometepe Nicaragua? The best time to visit Ometepe Nicaragua is in the dry season which runs from November to April. But, actually, if you visit in the wet season, or at least the shoulder season after the wet season, then you’ll have a better chance at witnesses the beautiful waterfalls on this island in particular, so it’s up to you. But we visited in March and had a brilliant time. The weather was perfect! 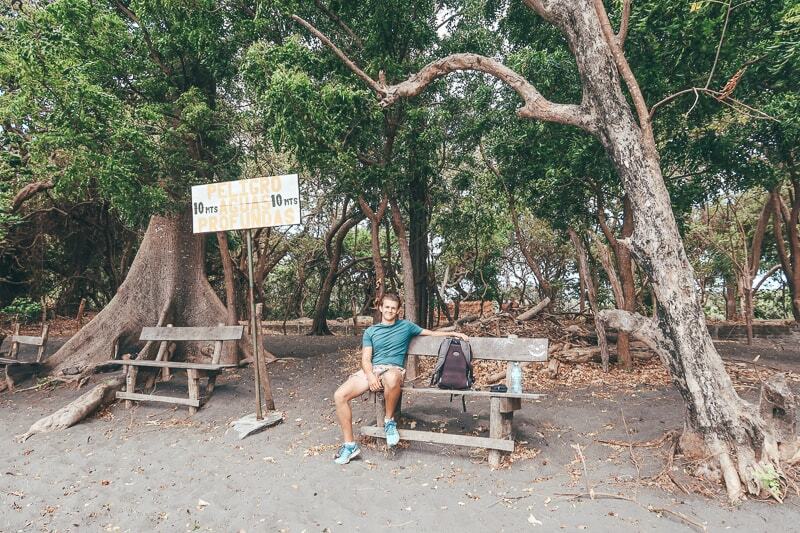 How long should you stay in Ometepe Nicaragua? I was warned before I visited that I would want to stay longer than initially thought. And, I can totally see the appeal. I didn’t stay longer as we simply didn’t have time, but this is a perfect place for backpackers, couples and basically anyone looking to relax. How do you get to Ometepe Nicaragua? Since it’s an island, you can only get there via boat...well, or plane! Let’s get the plane out of the way. Yes you can fly from the capital and even El Salvador, but I believe it’s quite expensive. Even so, if you’ve got the cash to splash then you can check skyscanner for flights. The runway is pretty short, but you literally land in front of a volcano so I imagine that landing view is fantastic. Boat: There once was a time you could get a boat from Granada, but as of writing, that’s currently not running. So, you can get a boat from Rivas. If you’ve just been to San Juan, then you can easily get a taxi or local bus to Rivas. It’s not far. The boat from Rivas is Nicaragua's idea of a “ferry”. It’s not a ferry in the sense that I’ve been on before...actually it’s quite small. It costs around $2-3 with the tourist tax for the ride and it takes about 2 hours. The boat itself has lots of seats, but when it’s choppy outside, you will probably feel quite sea sick. You can typically buy snacks on board if you wish, and the boats leave quite frequently! Ometepe is a small island, but you won’t want to rely on the chicken buses to get around. They are slow on the roads and it always takes twice as long to get anywhere. Your best bet is renting a moped for the day! We rented ours for $15, although everywhere online said it would be around $25...and the tour guide at Rivas told us we were getting a good deal if we got one for $30...people lie. Anyway, we rented from the hotel we stayed in which was --- and they bring it too you and they’re in really great condition. Fuel isn’t expensive on the island, and again, I read in a blog post that it was...it’s ever so slightly more expensive than the main land, but it’s all super cheap anyway so won’t make a difference to you! You could get around the island and back on a tank of fuel. 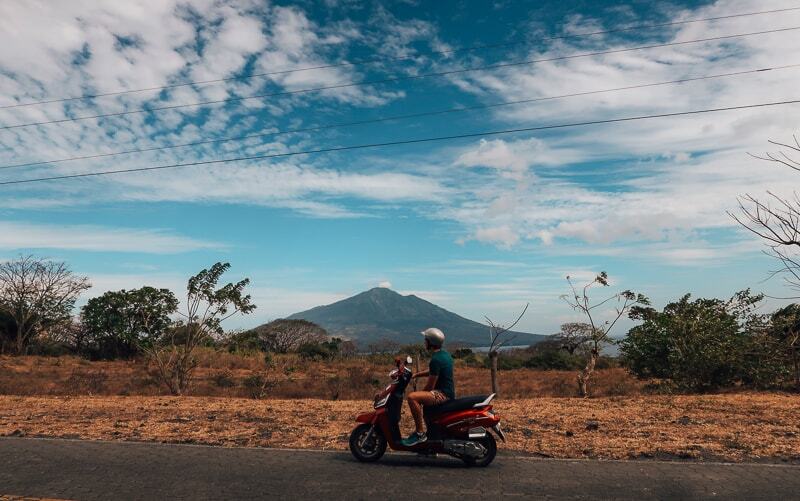 The moped gives you the freedom to create your own route and do things in your own time and I personally think it’s the best way to get around Ometepe. I never drive a moped, but since the roads were so good and it was just one stretch, I gave it a go here and it’s actually a lot easier than I thought! You can actually rent out big quad bike type things too, which looked awesome, but they’re more expensive. There are tuk tuks on the island and taxis that you can use for transfers, or short distances. If you’re staying at a hotel that isn’t in the main area near the ferry port, then you’ll often find they will have arranged a shuttle bus for you. So, let’s look at some of the top things to do in Ometepe Nicaragua. Bradley and I pretty much did most of the things recommended to us, bar a few which weren’t possible due to the time of year, and we didn’t hike any more volcanoes! So this is on the list of the top things to do in Ometepe Nicaragua, because it is one of the best things...but I didn’t do it. Why not? I hiked up enough volcanoes on this trip already! But, that being said, if you like a challenge, then you will love this. The highest point on the island, the Concepcion volcano is 1,610 meters (5,282 feet) and not for the faint hearted, or unfit. It’s a tough hike but the view is worth it. It’s about 10 hours round-trip and it should cost you around $30. Don’t go with someone “super cheap” because it will probably be a scam. Another day, another volcano. So as you know by now, there are 2 peaks on Ometepe Island in Nicaragua. This is the smaller of the two on isla Ometepe at a height of 1,394-meter. It’s needed to have a guide when you are hiking this volcano. It’s very slippery and sometimes the markings can be quite difficult to read so you need to be careful. People have lost their lives! Depending on where you book your guide, it could cost anywhere between $35-55 dollars. Try and negotiate a good deal, especially if there is a group of people. 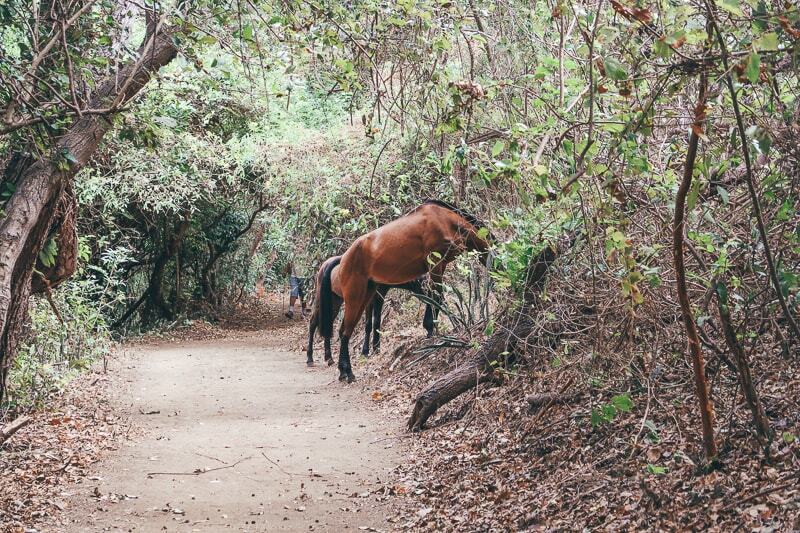 There are actually a variety of trails leading up and down and if you want a change of scenery, then you can head up Finca Magdalena and return down the Santa Cruz Trail. It will take 3-4 hours up and 3-4 hours down. You can find loads of information and tips from this couple who hiked it! Well, before I visited this place, I misunderstood that it was a “hot spring”..basically because some people have called it a hot spring. Whilst it’s not a hot spring (disappointing), it was still very beautiful! It’s basically a watering hole which is a natural lake that’s sectioned off so it’s turned into a natural swimming pool with fishes. It’s a very beautiful place to relax and there is a restaurant and bar to enjoy some drinks and fresh coconuts. There is even a little tarzan type swing for the brave! They have lockers and changing rooms for your things and it costs $5 for entrance. The butterfly garden is actually part of the Charro Verde complex which I will discuss in the next point. It’s part of your entrance ticket and it was quite a pleasant surprise. 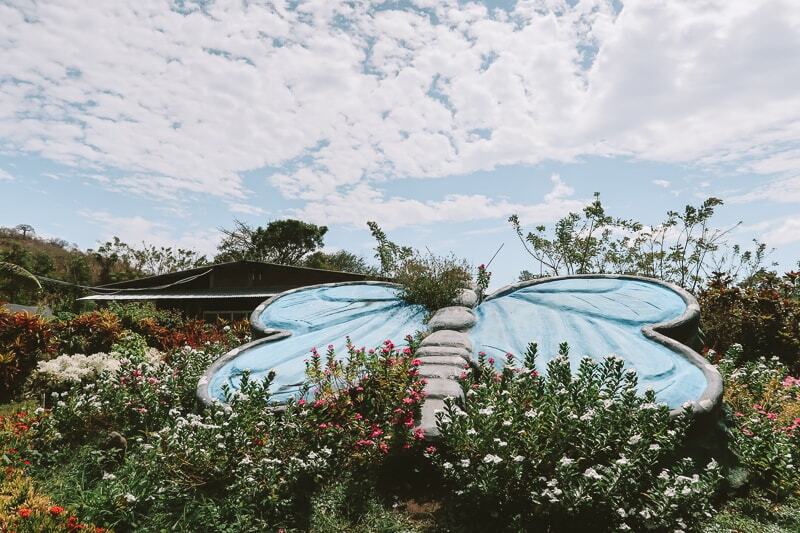 I’ve never really been in a butterfly garden but this was really tranquil with water fountains, turtles and lots of beautiful butterflies flying around you! Remember don’t touch them. But you can take lots of cool photos of all the different colours. 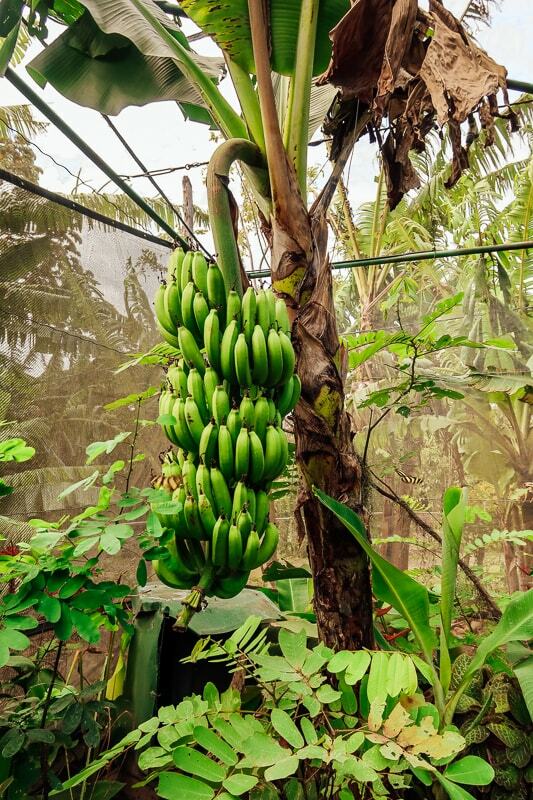 There are also lots of cool banana trees too. Charco Verde is basically a nature reserve type area that has a black sand beach on the lake. You enter via a hotel area and it's a 5 dollar for entrance to everything and you can walk around the lake. It only takes about 35 minutes to walk around the lake, but perhaps longer if you stop a lot and if you relax at the beach! Anyway, you will see howler monkeys (hear them before you see them), you’ll see wild horses, dogs and many more animals. It’s a tranquil area, that could maybe do with a spruce up! There is also a restaurant and gift shop with toilets on site for afterwards and there is no cost to park your moped. Saying that, there is no cost anywhere on the island to park your moped! We drove past this place twice, and didn’t enter..but I actually regret that. So if you want to experience, smell, eat and make raw chocolate then a visit to the El Pital Chocolate Paradise should be on your list. 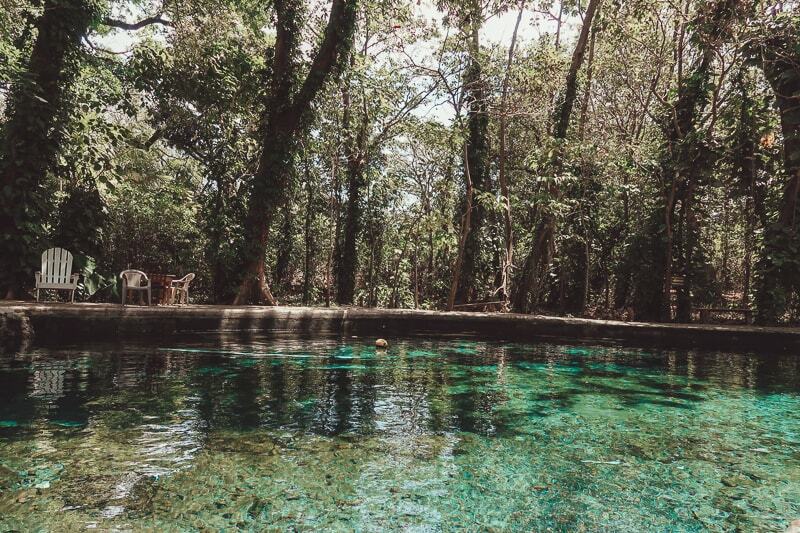 It’s considered one of the most magical places in Ometepe Island. It’s definitely a great place to visit for a few hours and one of the top things to do in Ometepe Nicaragua. So the “beaches” are lake beaches, not sea beaches, but they have sad all the same. As you drive along the stretch of road around the island you’ll come across beautiful stretches of beach. Simply pool over at any spot and you’ve got a perfect picnic area. Playa Santa Domingo is one of the more popular areas and there are quite a few restaurants in this area offering good food and cheap drinks. But I say you grab a towel, have a picnic, then take a dip in the water- perfection. We were the only ones on the beach when we went, it was magical. Punta Jesus Maria sunset is outstanding. It’s in my top 5 sunsets in the world and it was more than I could ever imagined. When you are sightseeing through the day, make this your last stop at get there an hour before sunset. There is a nice bar serving cheap drinks and you can walk along the sand bank and take photos. Once that sun sets you will be greeted with bright pink, orange and yellow clouds. It’s bright, beautiful and lights up the whole sky! It’s a great spot to have a few beers with friends and it’s also really super romantic! Come on- it’s a sunset, they’re always romantic. You can head out to the “point” and take a picture of the volcanoes. If you get the angle right, you’ll get a picture of both on each side. 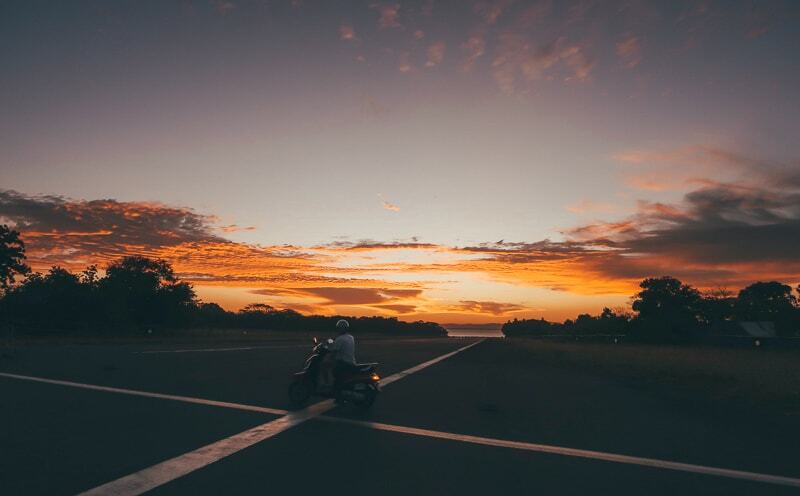 If you’re staying in Moyogalpa, which I like to call the “capital” of Ometepe, then you can get a tuk tuk to the sunset if you’re drinking, or don’t have a moped. Also, if you do drive yourself, you’ll drive through the airport runway which is pretty cool! On the Maderas side of the island, Rio Istián is a river and marsh area that’s filled with wild animals and a perfect kayaking spot. IF you want to spot animals, then you should kayak down the river with a guide! You’ll probably hear the howler monkeys, which by the way, sound closer than they are. I had one up on a tree growling at me and I screamed like a baby. The price of a kayaking tour will depend on your haggling skills, the time of year, and how many people are in your group. It can range between $15-20 for a 3 hour tour, which let’s be honest, is a great deal! Anyway, you can get there via moped, then it’s about a 40 minute hike to the waterfall. I’ve seen the pictures online and it looks pretty impressive. Ometepe Nicaragua is famous for its pre-Colombian past. This means you can discover stone carvings and petroglyphs throughout the island. For those who love history, you have a better chance of finding them at Hotel Finca Porvenir and on Finca Magdalena, which are both located on the slopes of the volcano Maderas or in the museum of La Ceiba. 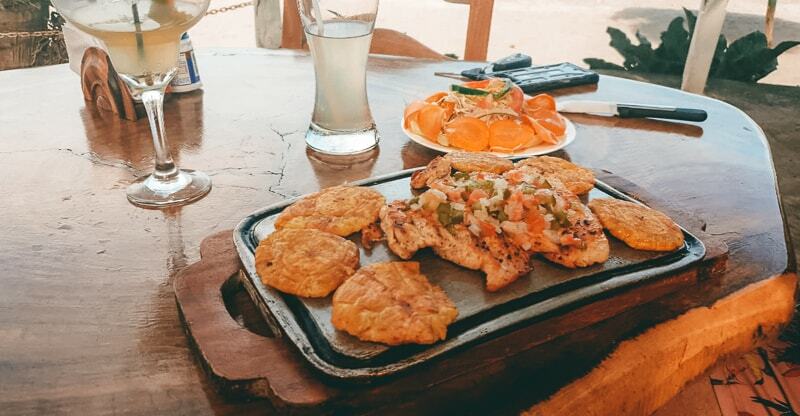 Moyogalpa is the main “hub” of Ometepe, it’s the port hub and it’s also got some great restaurants. We dined at a brilliant pizza joint (massive pizzas), a brilliant coffee shop and there are other great restaurants. There is something to suit everyone and it’s all reasonably priced. Okay, so this is the “central hub of Ometepe”. It’s where you will get your ferry too and from there you can go to other areas. Brad and I stayed here because we wanted to be close to the port and we wanted to have access to restaurants etc. Plus, there is nothing on the island you can’t get to quickly when you have a moped, so therefore I think this is the most convenient place to stay, plus it’s close to the best sunset area in Punta Santa Maria. Balgue is a more remote area with fewer hotels and hostels and everything is located on the side of the road. It’s got some secluded and beautiful areas of beach and everything is accessible with just a few minutes drive on a moped. 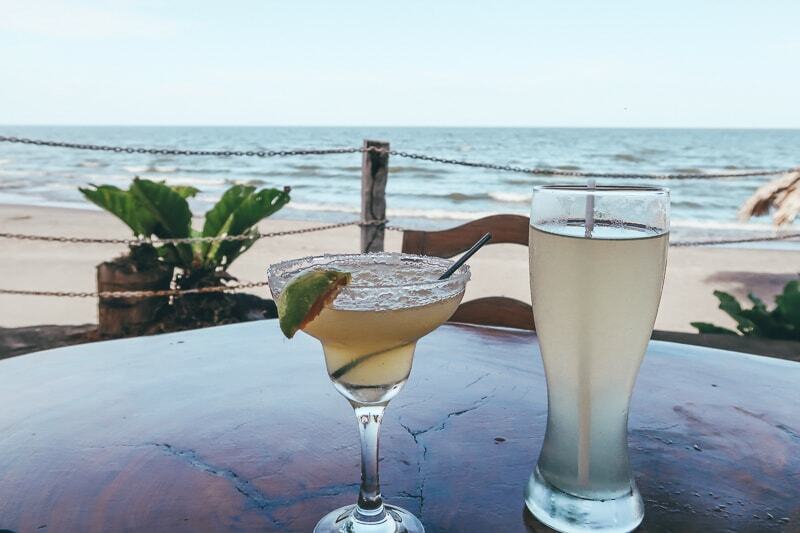 Located not far more Balque, Santa Cruz offers beautiful beaches, views and there are a few places to eat and drink. There are lots of beautiful properties in this area, but it’s a good idea to have a moped to get around. 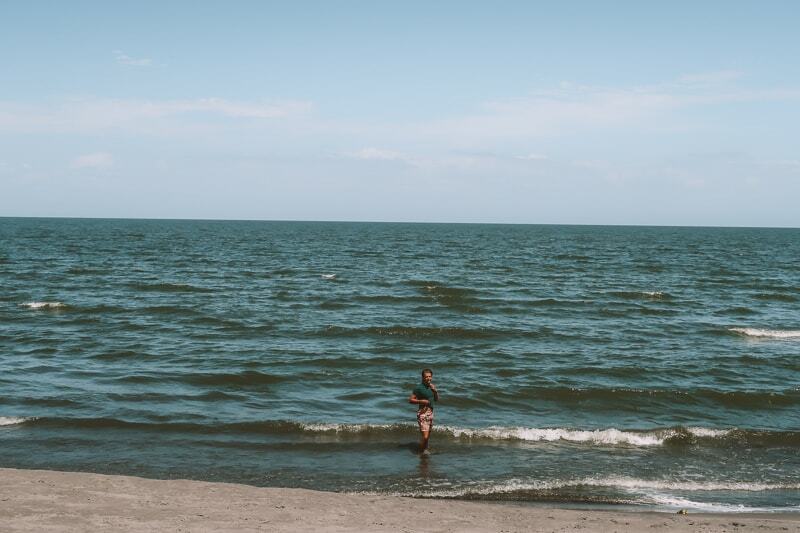 There are lots of great places to stay in Ometepe so below I’m going to name my top 5 based on where we stayed and where I have seen when I researched! These are all over the island and I’ll mention the area beside the hotel. This is a really nice located on the Santo Domingo beach, only 600 m from Santa Cruz. It’s very beautiful, well designed and it’s got very high ratings. If you’re looking for a little luxury, this is probably one of your best bets. Jungle houses in a beautiful complex on the slopes of the Maderas Volcano on Ometepe island. If you really like beautiful views then this is the place to stay. Lovely designed rooms too. Great for couples. Located in Balque. If you like glamping, then a stay in these luxury tents is what you need. Located in Santa Cruz, it’s pretty secluded and authentic. A different experience! Featuring stunning sunset views, a beautiful swimming pool, beautiful rooms and much more. This is a property that offers it all and it’s great value too. If you’re looking for a cheap backpacking spot, that includes a great breakfast, then this is a great spot in the main port town. You can walk from the ferry, no need for taxis. 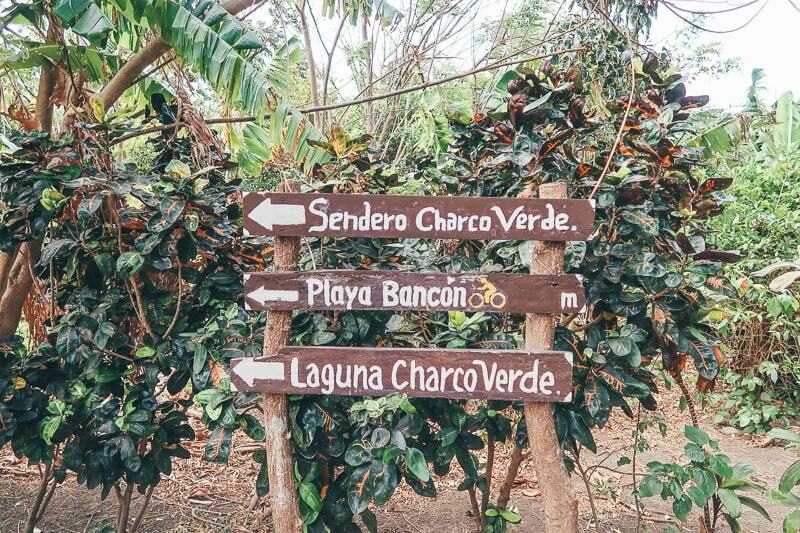 Where to after Ometepe Nicaragua? 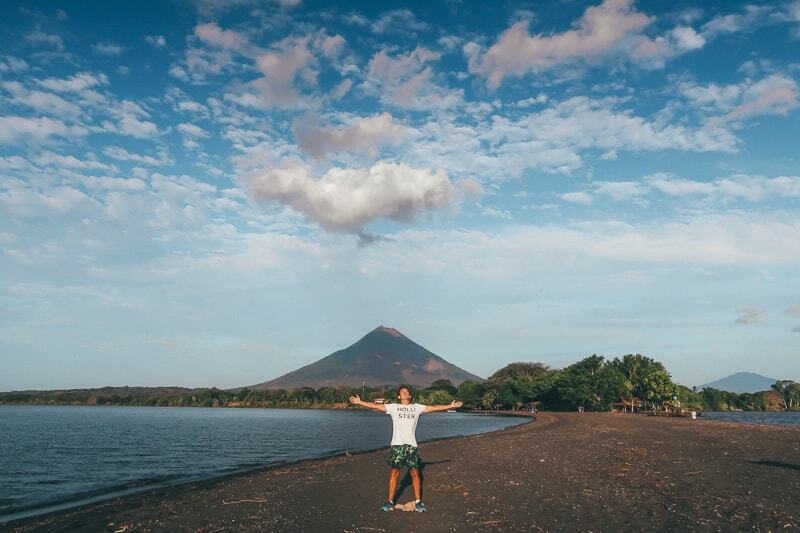 After visiting Ometepe, you’re in a perfect position to visit a variety of spots in Nicaragua. You can head to the beaches of San Juan Del Sur and get your surf on, or you can head to the cultural pot of Granada with its beautiful colonial architecture, great volcanoes and much more!